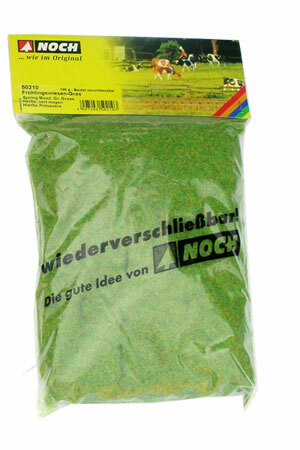 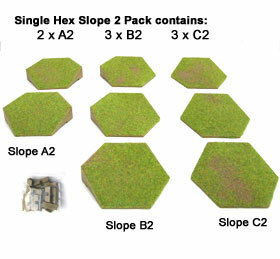 Two boxes of Hexon were used in the above layout. 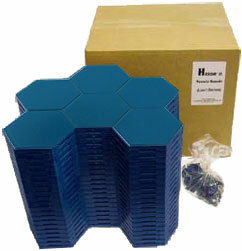 The BLUE Hexon Box Set is colour matched to complement the rivers, lakes and brooks. 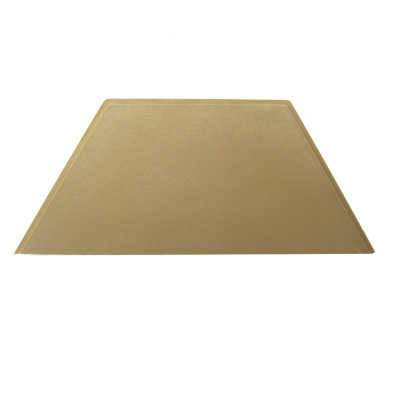 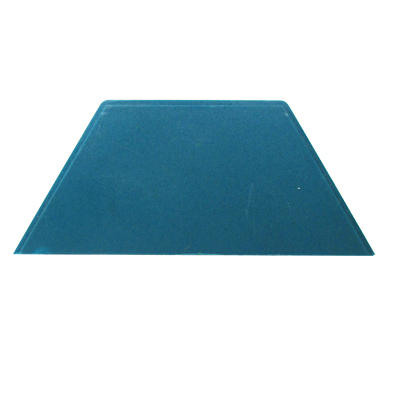 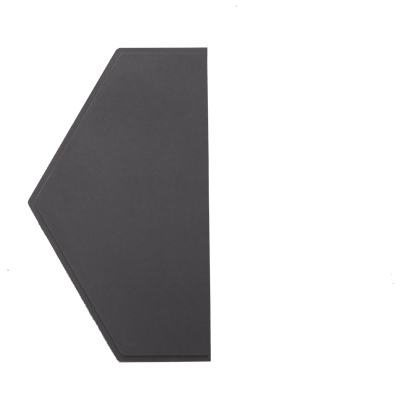 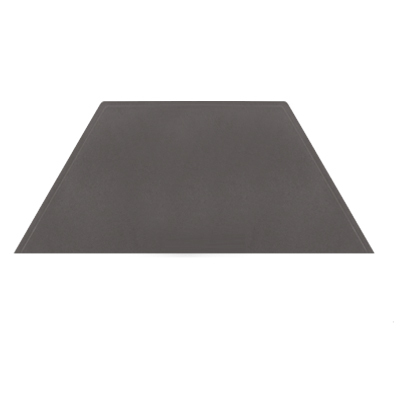 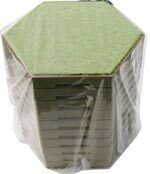 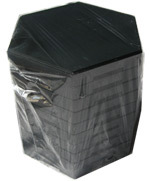 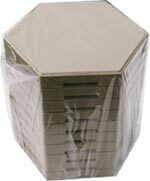 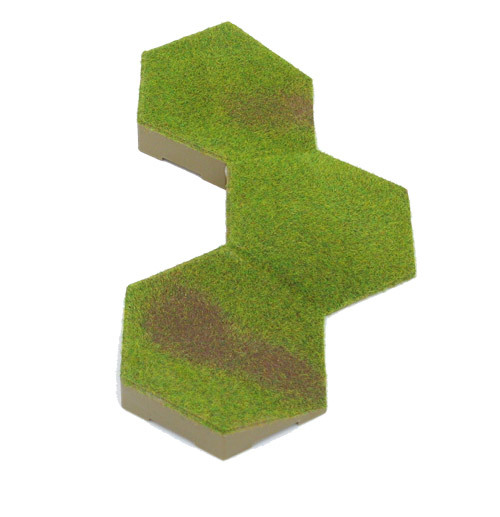 Figure bases of the same colour are also available, see Figure Bases. 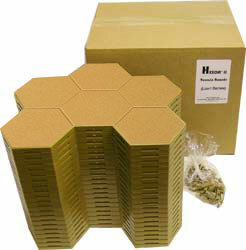 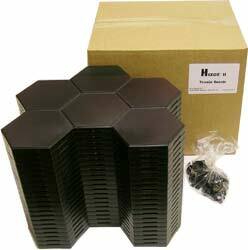 A £5.00 discount per box will be applied on orders of 3 or more Hexon Boxes. 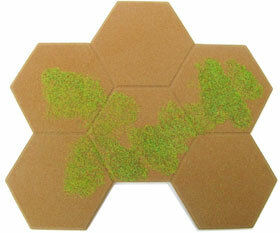 Desert (D70806), NEW Desert Transition and Marsh/Swamp. 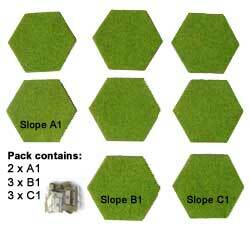 items may be slightly different. 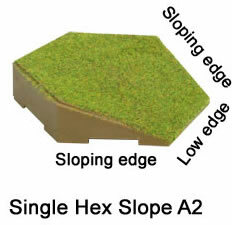 Designed to be used in conjunction with Hexon Terrain System (100mm across flats). 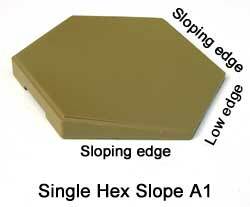 The precision injection moulded slope pieces have been designed to be used in conjunction with Hexon Terrain System, and are the same colour as the brown Hexon Boards and our Hexon scenic products. 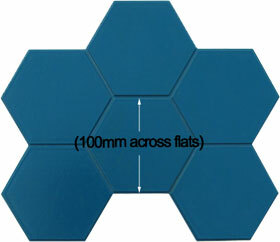 The Hex pieces measure 100mm across flats. 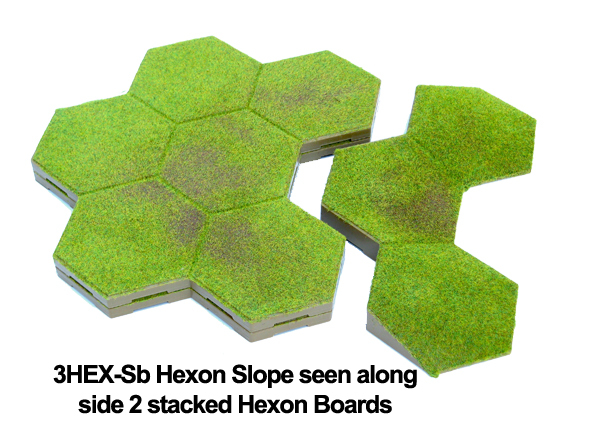 The Single Height slope pieces are the same height as the Hexon Terrain boards, 12mm, and therefore raise the terrain height by 1 stacked Hexon board. 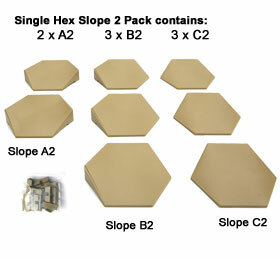 They are designed to be used in conjunction with Hexon Terrain System. 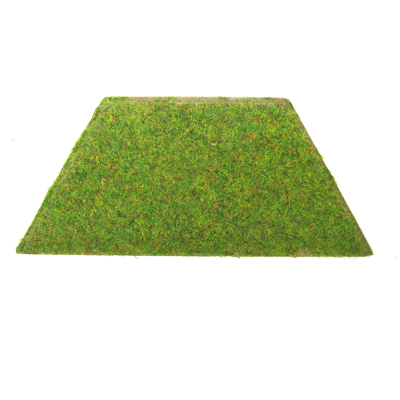 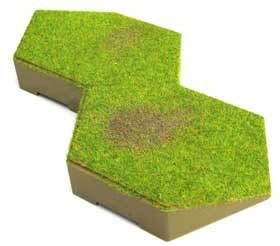 Using these specially designed slope pieces gives great flexibility to the terrain system, providing a fully contoured landscape for your battlefield. 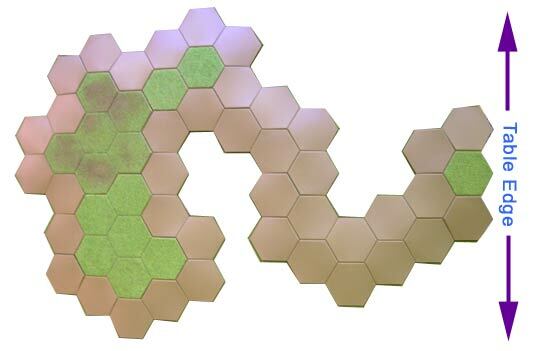 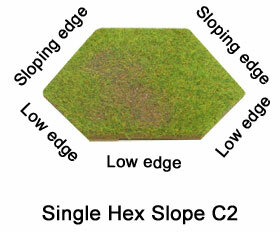 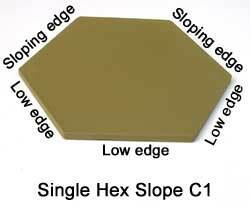 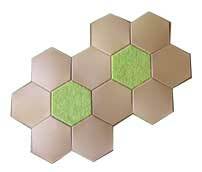 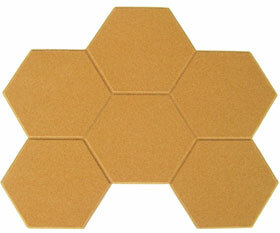 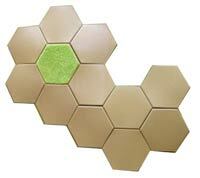 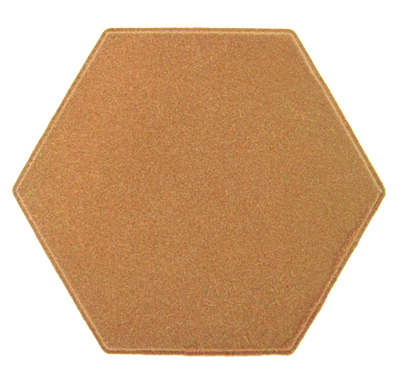 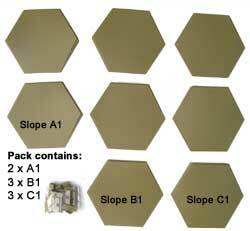 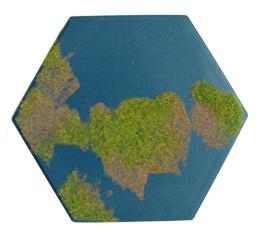 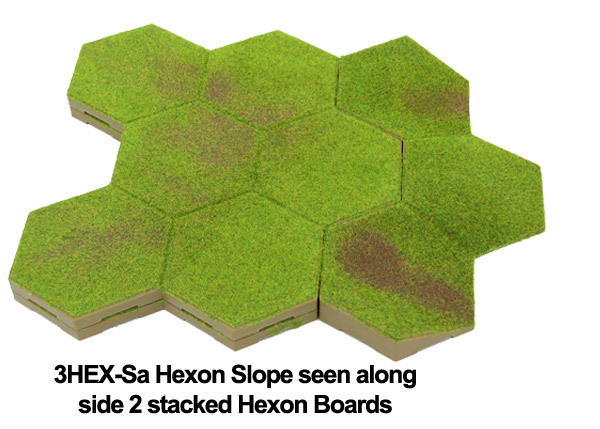 These single slope hexes raise the terrain height by 1 stacked Hexon board. 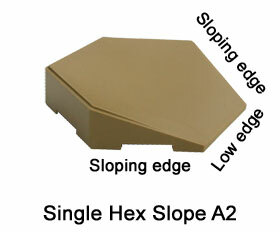 Precision injection moulded in the same colour and polymer as all other Hexon products. 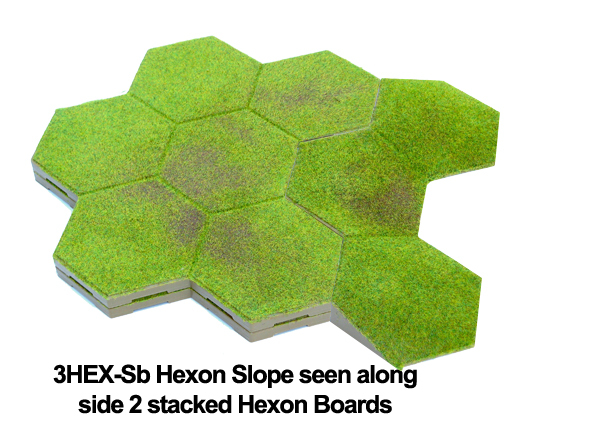 Designed to be used in conjunction with Hexon Terrain System (100mm across flats and 24mm in height approx ). 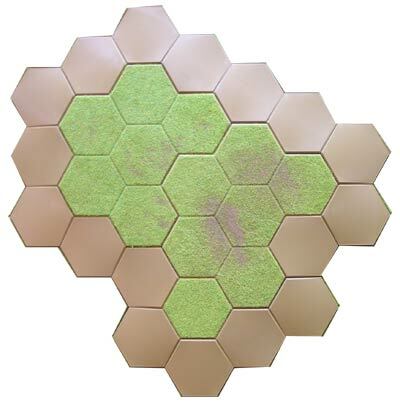 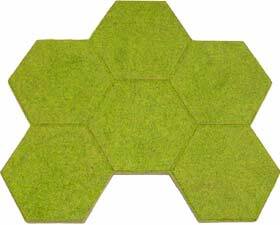 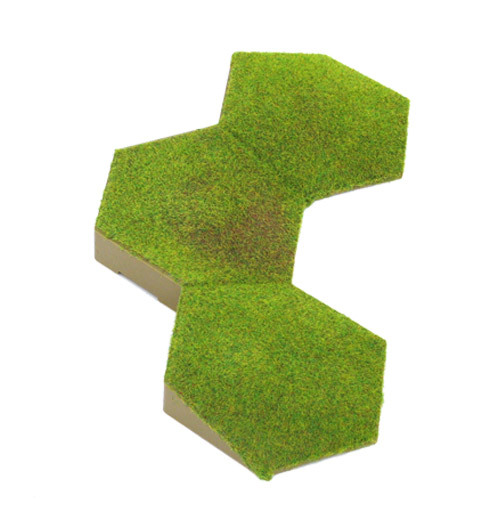 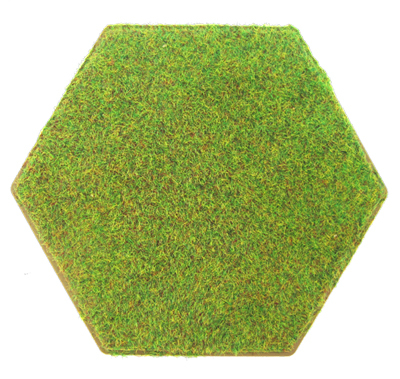 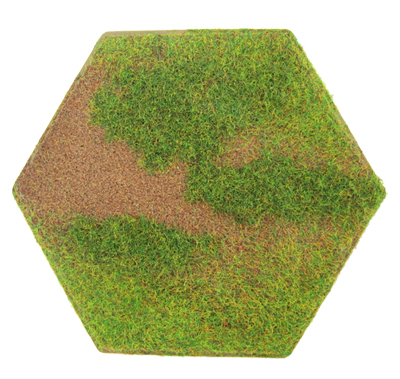 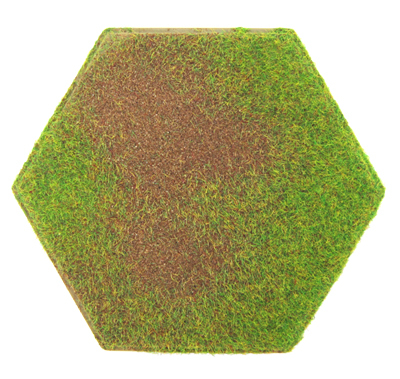 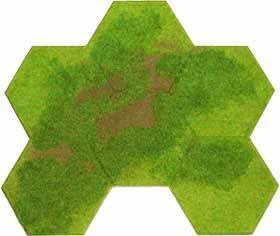 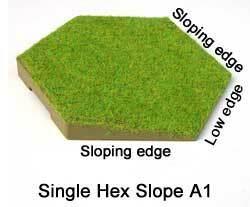 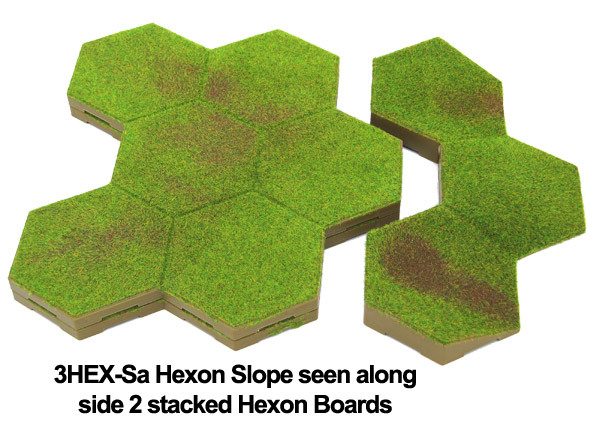 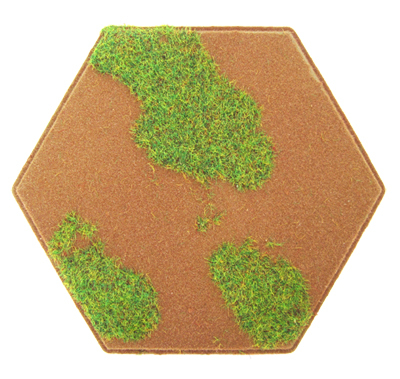 These single hex slopes raise the terrain height by 2 stacked Hexon boards, providing a fully contoured landscape for your battlefield. 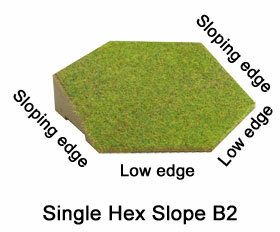 Designed to be used in conjunction with Hexon Terrain System. 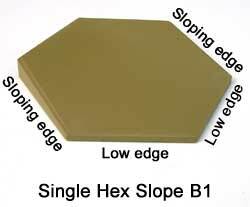 Slope Height; 2 stacked Hexon boards. 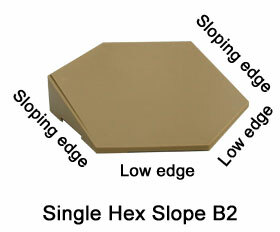 2 Hex Slope BB is made using 2 x B2. 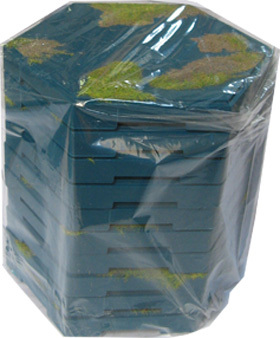 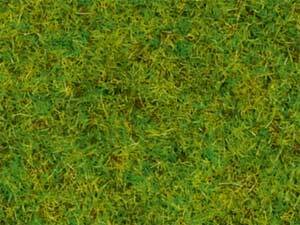 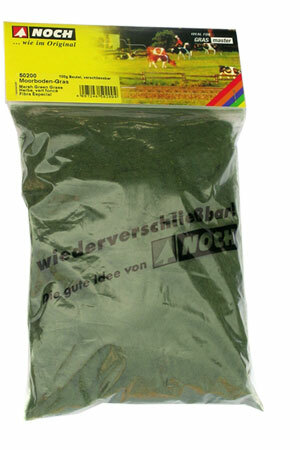 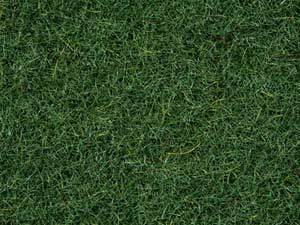 Light Brown, Black, Blue, and ready Flocked Green.